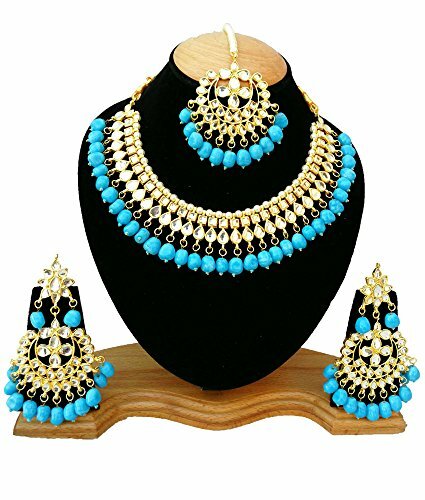 Awesome latest designer wedding, party wear bollywood style beautiful gold plated meena kundan choker necklace alloy jewelry earrings tika set highlight your pretty appearance. whether it is necklaces everything is exquisite and go well with the ethnic outfits gold plated meena kundan necklace set. Made from brass the necklace set is light in weight.Your vanity case is incomplete without this knot shaped white crystal embedded gold plated meena kundan necklace set, maang tika and earrings. It is definitely an eye catcher. The snug fit is ideal for western attire and ethnic. It will give you a smart edge. This product is handmade & hence the product can be non-uniform & vary in color & texture.Keep Its Away From Spray & Perfume. If you have any questions about this product by Finekraft, contact us by completing and submitting the form below. If you are looking for a specif part number, please include it with your message.